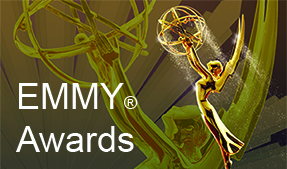 Vang has received Emmy® awards for outstanding achievement. However, of most importance, he said that his job comes with a responsibility to educate viewers – and now – personally – his friends. While I’m working, I’m also grabbing photos and media from my phone to inform people on Facebook. 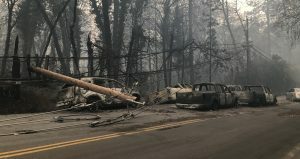 That way, people don’t have to wait until the 11 p.m. news to get updates.” Vang said that covering the fire has been heart-wrenching, watching people lose everything. In many cases, people lost their lives as caravans of cars trying to escape erupted into infernos. 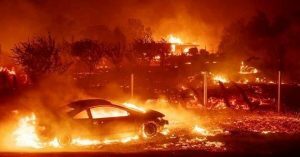 Sacramento KCRA Channel 3: Skies over northern California have been so smoke-filled that in many areas, the air has been deemed dangerously unhealthy. 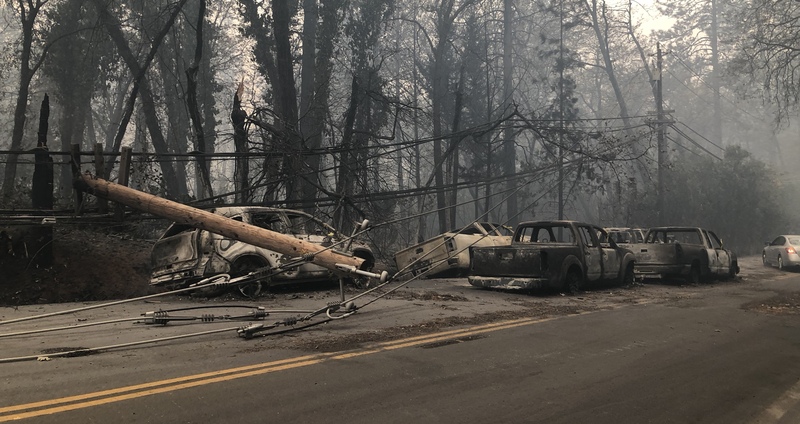 While bad to breathe, the smoky air is more than tolerable compared to what many Butte County residents are enduring as a result of the Camp Fire. 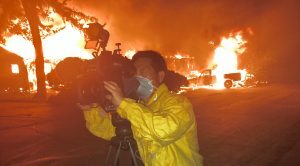 TV stations throughout the region have provided opportunities for viewers to donate and help fire victims. Sacramento NBC affiliate KCRA dedicated airtime for a telethon, teaming up with the American Red Cross to raise money for wildfire victims. Viewers watched and overwhelmingly responded. 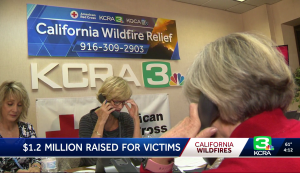 KCRA was able to raise $1.2 million. The Camp Fire is the deadliest, most destructive wildfire in California history. 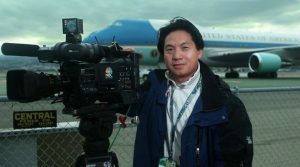 Sacramento: For the second time in the past several weeks, a Sacramento-area TV crew has had equipment stolen from a news vehicle. A CBS13/Good Day crew was robbed at about 5 a.m. while covering a story at UC Davis last month. Recently, a KCRA news crew was burglarized in a suburb of Sacramento at about 6 a.m. Their van was in a parking lot and they went to grab a cup of coffee. When they returned, the photographer and reporter saw that a window had been smashed and their camera and a backpack containing at least one laptop had been stolen. They called police. Investigation of a suspicious vehicle that was seen nearby lead to an arrest. The camera and other equipment were recovered. Two men in their late 20s were booked into the Sacramento County Jail. 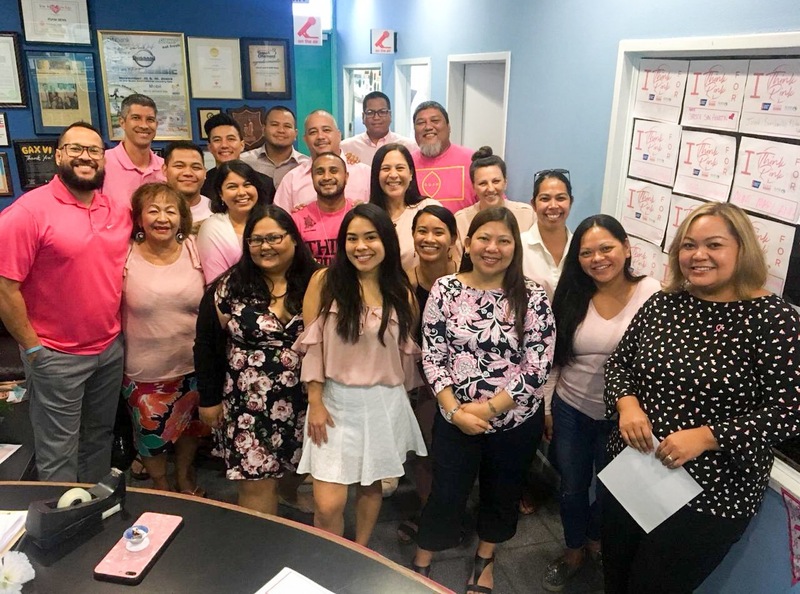 Guam KUAM – It was Think Pink Day Oct. 22 at KUAM TV in Guam. It’s been five years since the station launched Think Pink Day and it’s still going strong. 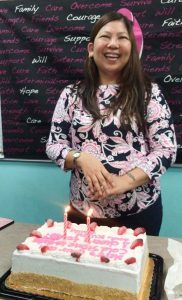 The date marks the birthday of KUAM Office Manager Christie San Agusin, a breast cancer survivor. On “Think Pink Day,” we invite our community to join us by wearing pink and posting special tributes to survivors and those who have lost their lives to breast cancer by using #thinkpinkguam on their social media accounts” said Lacee Martinez of KUAM. “We created a special sign they can pick up at our office or download to commemorate their loved one’s name.” All in the name of awareness and saving lives. 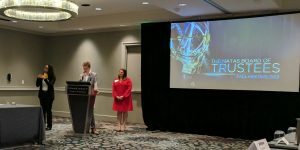 Atlanta: Fall 2018 National Trustees Meeting – National Academy of Television Arts & Sciences – USC freshman Saul Singleton paused the meeting with emotion when a portion of his scholarship award-winning project was shown to national trustees from the Academy. Singleton was presented with a $10,000 scholarship by the National Academy to support his storytelling endeavors. “Discrimination, it just happens without question,” Singleton said. 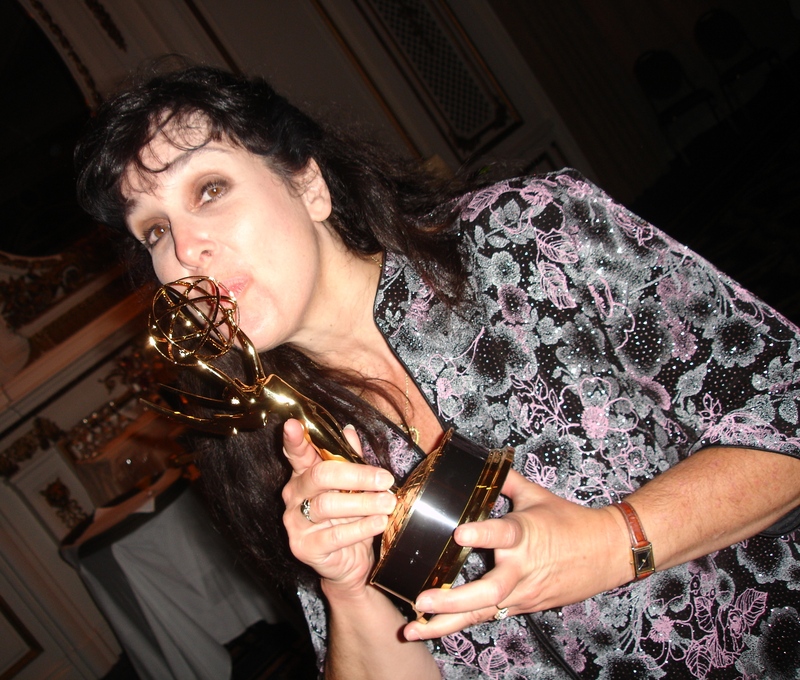 “I want to change that and TV is an important medium. I want queer people to know they make a difference.” Singleton said that his video displays a demand to retain his voice as an artist. Entitled, Since the First Day We Met, Singleton’s story line revolves around a deaf boy’s crush on a fellow student. In the end, the two boys share a quick kiss. Fresno KFSN ABC30: Gaby Ornstein is calling it a wrap. 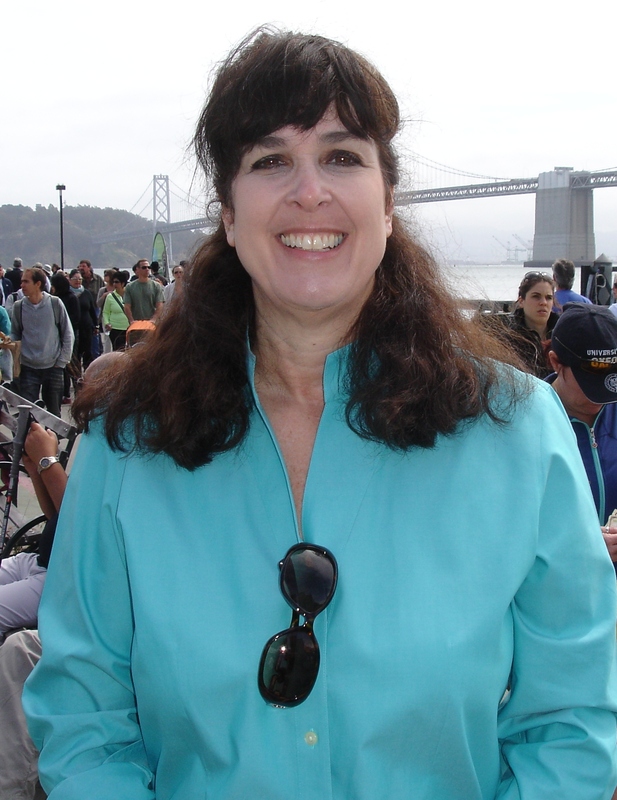 After working 35 years as a photojournalist and editor, she’s decided to retire. Ornstein was one of the first women photographers in the industry when she started at ABC30. 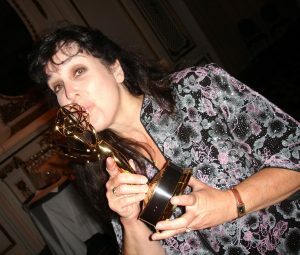 She’s received multiple Emmy® awards for her work. “Gaby has always taken an extremely high level of pride in her job and her attention to detail is unmatched,” said ABC30 News Director Mike Carr. Ornstein said that her tenure at KFSN has been a fun and positive experience.